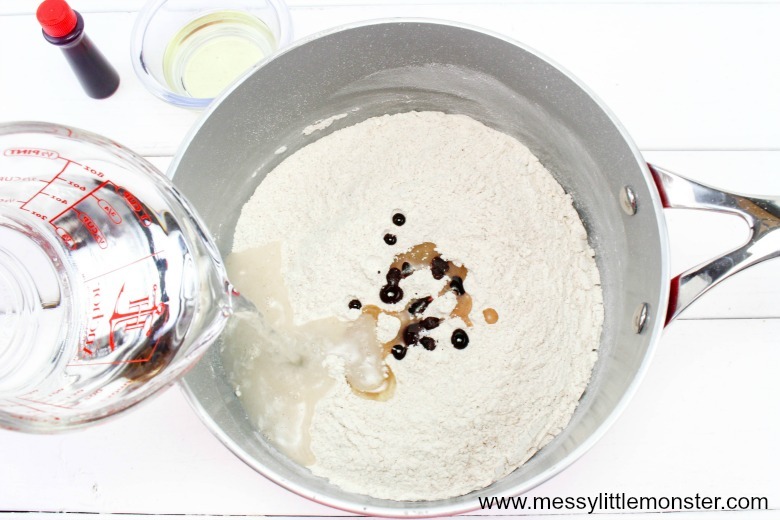 Apple scented playdough recipe - Perfect for Autumn! 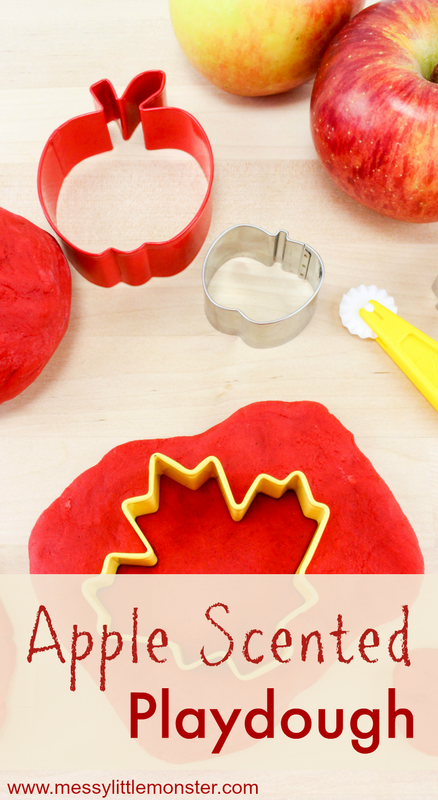 This apple scented playdough recipe makes a great Autumn activity for toddlers and preschoolers. 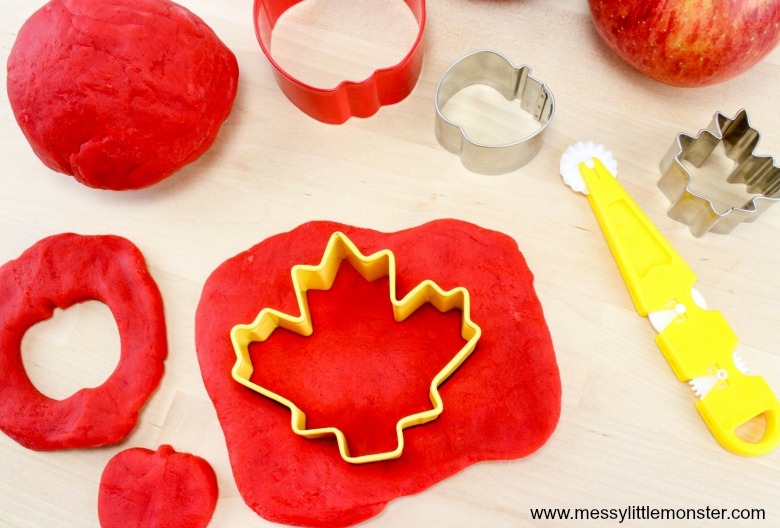 Bright red apple playdough that smells good enough to eat would be a perfect addition to an apple theme or an Autumn project for kids. Why not get some apple themed or leaf themed cookie cutters to use with your homemade scented playdough! 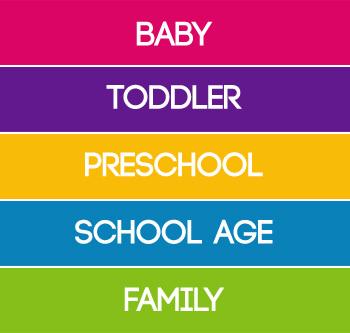 There are so many fun Autumn activities for toddlers and preschoolers to try at this time of year! As well as making and playing with this apple scented playdough recipe you could have a go at making some apple themed art, learning numbers with our apple tree fingerprint worksheet or make and eat an apple themed snack! Below you will find step by step instructions for our apple scented playdough recipe. The cinnamon and nutmeg spices that are added to this homemade playdough make it smell soooooo delicious and the kids will love the bright red colour! We have lots of other fun homemade playdough recipes for you to try too! We have a fun rainbow playdough recipe or for toddlers and preschoolers that still put things in their mouths why not try our edible playdough recipe. I've supplied links to Amazon for easy purchasing! 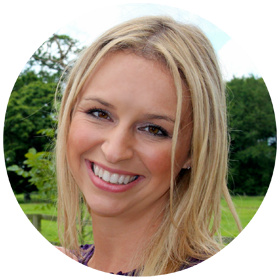 Just click the links to be taken to the product pages! We are a participant in the Amazon Service LLC Associates Program, an affiliate advertising program designed to provide a means for us to earn fees by linking to Amazon and affiliates sites. This apple scented playdough recipe is easy to make but you do need quite a few ingredients. Before starting to make your homemade playdough I would suggest getting all your ingredients measured out and have them ready alongside a large bowl, spoon and saucepan. 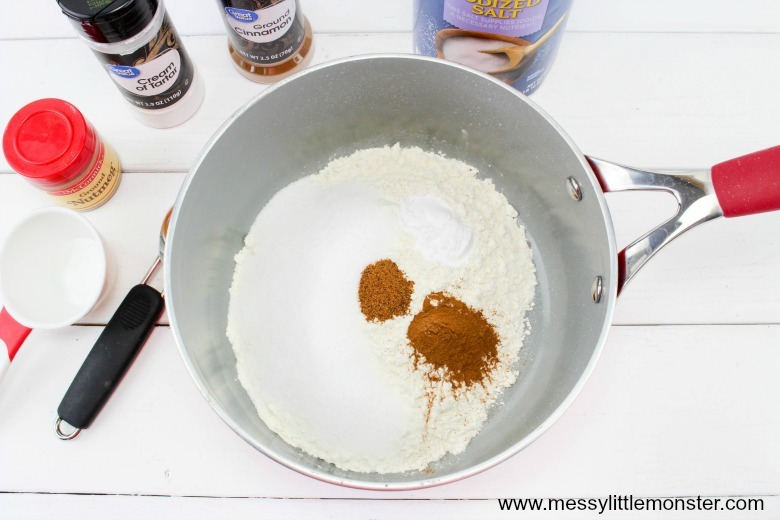 Place all the dry ingredients in a medium size saucepan and mix them together. 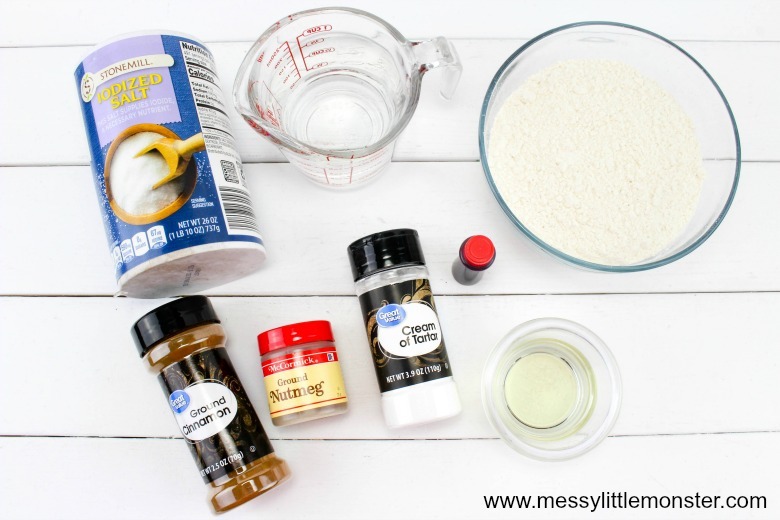 If you have eager toddlers and preschoolers they could help you tip in and stir the ingredients together. 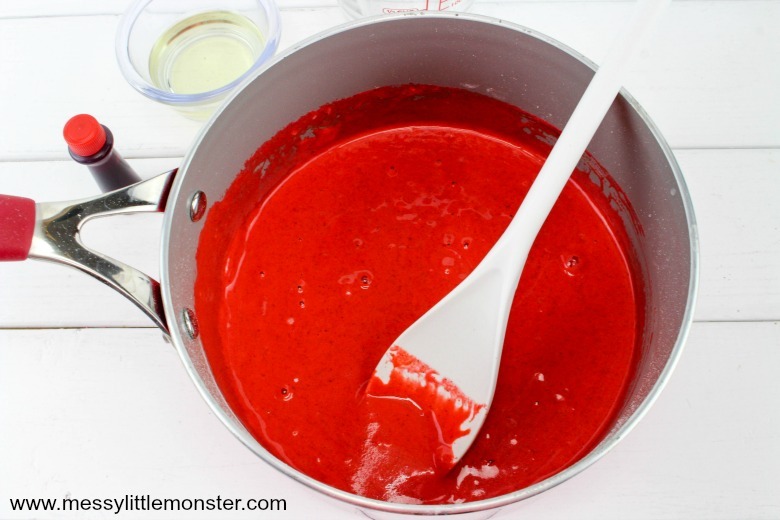 Next, add the water, oil, and food colouring into the saucepan and mix all of the ingredients together well. 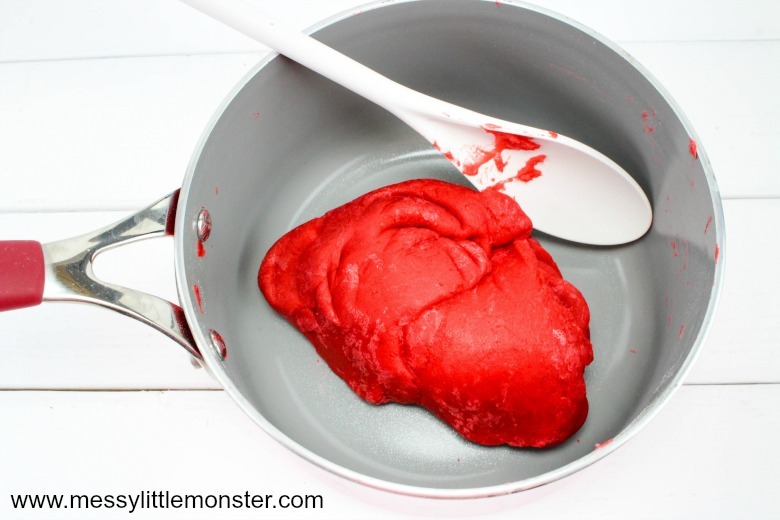 I would suggest adding a lot of red food colouring if you want a nice bright red playdough. Cook the playdough mixture over a medium heat. You will need to stir the mixture constantly for 4-5 minutes until it begins to form a ball. Once the ball of playdough has formed flatten your playdough, fold it, and continue to flip it for about another minute until all the stickiness is gone. Remove your apple scented playdough from the heat and let it cool for a few minutes. Once the playdough is cool enough to handle knead the playdough. If it’s still sticky then add a little bit of flour. If you cook it long enough then extra flour shouldn’t be needed! Now for the fun part! Enjoy playing with your apple scented playdough!! 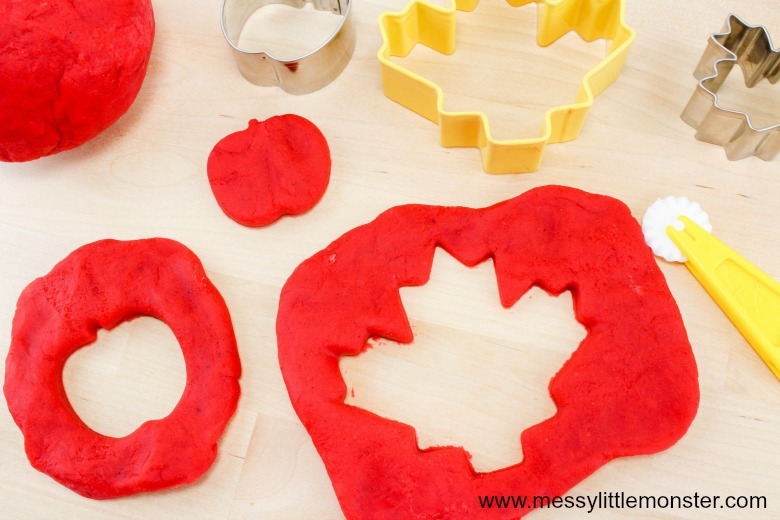 You could use apple or leaf shaped cookie cutters to make shapes in the playdough, you could make apples by rolling the playdough into balls and adding small sticks as stems, or you could just enjoy squashing, squeezing and making patterns in the playdough. 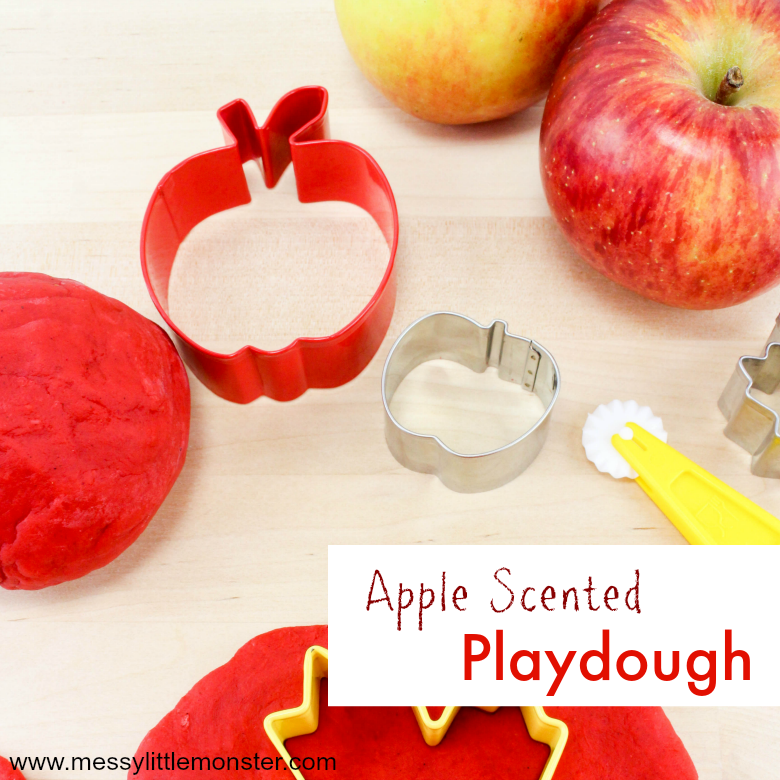 How much fun would this apple scented playdough be for a toddler or preschooler playdate this Autumn! This apple scented playdough recipe smells good enough to eat! Why not cook up a batch of this homemade playdough as an Autumn activity for toddlers and preschoolers! Don't forget to check out out our edible playdough and rainbow playdough recipes too!